Today I was checking on the bees and noticed they were building combs like crazy and getting close to the back of the hive. I needed to get in to add spacers between the bars and I figured as it was a sunny day I had time to do an inspection. I got dolled up in my gear as I was going to be more invasive than usual. That turned out to be a very good idea. Things were going great until one of the new honey combs fell off the bar and landed on the bottom of the hive. Bees came charging out of the hive with a loud, annoyed buzz and some started drowning in honey at the bottom of the hive. I continued on with my inspection, thinking that I might have to get that comb out of there or maybe they'd figure it out on their own? As I got further along and could see the bees were doing just fine with raising more bees, I decided I should get it out. I ran back into the house for a bowl and then tried to lift the comb out of the hive. All covered with angry bees. My total beekeeper sting count is now up to three. I got stung once on each hand, through my gloves. At least that allowed me to get the stingers out with minimal effort. I went back into the house for a large spoon. Today's on the left, the older honey on the right. After getting the comb out, finally, without any more stings, I gradually got the hive put back together. Then came the task of helping the still alive bees out of the bowl of comb and honey. Hopefully, they can get the honey off themselves and find their way back into the hive. If they can't I will feel bad but at least I know the hive is healthy and can recover from the loss. Once I got all the living bees off the comb I brought it into the house and strained it. 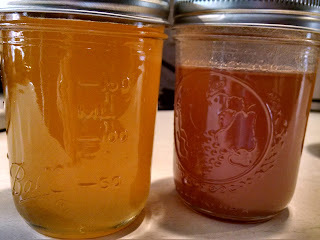 The one comb yielded 2.5 cups of honey. 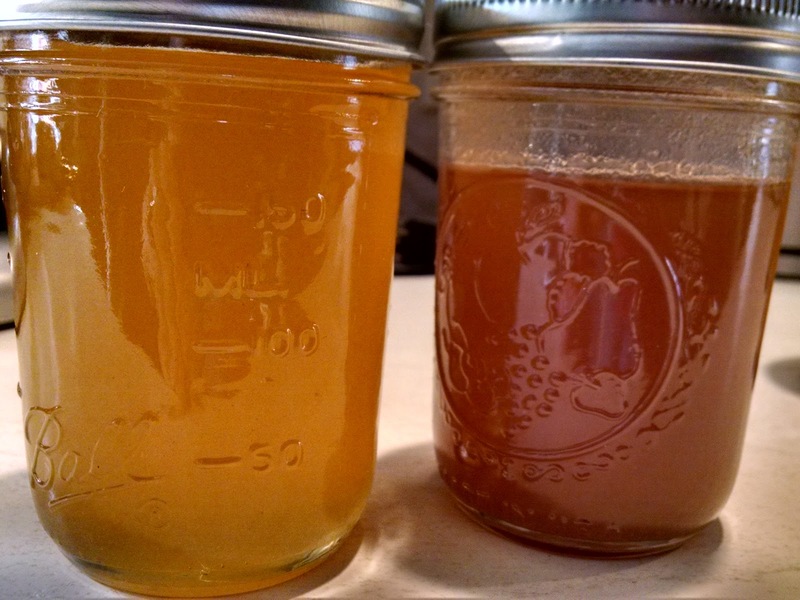 You can see from the photo it's much lighter in color (and less dense) than the honey I got after the winter. It also tastes different. The wax will be set aside for my friend and her soap making. Lastly, I made a batch of granola as we were out. I love making granola because the coconut oil smells so amazing when it bakes.